-	"we", "us", “our” "Company" and “ROOMHOPPER.com” shall mean ROOMHOPPER (FZ-LLC), a company registered in The United Arab Emirates. -	"you" and “your” shall mean the individual person creating an account with us and / or booking a reservation through us by using our website or by calling our call centre. -	use of any gender includes the other genders. 3.	c) – Your use of our website and all reservations you book through us are subject to the following terms and conditions which we may, at our absolute and sole discretion, amend at any time. You agree to be bound by the terms and conditions that are in effect at the time of your booking being made. -	lists of hotel amenities displayed on the website. 3.	c) – ROOMHOPPER.com may make improvements and /or change the website at any time. ROOMHOPPER.com and its suppliers make no representation about the suitability of the information, software, products and services contained on this website for any purpose, and the inclusion or offering for sale of any products or services on this website does not constitute any endorsement or recommendation of such products or services by ROOMHOPPER.com or its suppliers. All such information, software, products and services are provided "as is" and without warranty of any kind. ROOMHOPPER.com and / or its suppliers hereby disclaim all warranties and conditions with regard to this information, software, products and service, including all implied warranties and conditions of sale, to the full extent permitted by law. 4.	d) – ROOMHOPPER.com’ suppliers are independent contractors and not agents or employees of ROOMHOPPER.com. ROOMHOPPER.com is not liable for a supplier’s acts, errors, omissions, representations, warranties, breaches or negligence or for any losses, personal injuries, death, property damage, or other damages or expenses arising out any act or omission of a supplier. 5.	e) – ROOMHOPPER.com and its suppliers have no liability and will make no refund in the event of any delay, cancellation, overbooking, strike, force majeure event (see clause 11. a) below) or other causes beyond their direct control. 6.	f) – By offering hotels in international destinations for booking, ROOMHOPPER.com does not warrant that travel to such destinations is without risk. Accordingly, ROOMHOPPER.com will not be liable for any damages or losses that may be incurred by you as a result of you travelling to such destinations. You are strongly advised to check the relevant travel advisories issued by your government for any country you are visiting and to take the necessary precautions. ROOMHOPPER.com cannot be held liable for any loss incurred in the event of your failure to hold the necessary passports, visas and documentation for your journey. You are advised to check with the relevant embassies, consulates and/or visa departments from which you originate. It is your responsibility to obtain whatever travel documents are required. 7.	g) – The tax charge on ROOMHOPPER.com’ hotel transactions is a recovery of all applicable transaction taxes (including but not limited to sales and use, occupancy, room tax and excise tax) that ROOMHOPPER.com pays its suppliers in connection with your travel arrangements. Taxability and the appropriate tax rate can vary greatly by location. ROOMHOPPER.com' actual tax cost paid to the supplier may vary from the tax recovery charge, depending upon the rates, taxability in effect at the time of the actual use of the hotel by a customer and ROOMHOPPER.com is under no obligation to account to you or refund you in this regard. 8.	h) – Currency rates displayed on our website are not verified or guaranteed by ROOMHOPPER.com as being accurate and should be used as guidelines only. Rates are not updated every day and actual rates may vary. 9.	i) – ROOMHOPPER.com charges your credit card, debit card or PayPal account (as applicable) in the currency displayed on the payment page and does not assume any exchange charge issued by your bank. For clarity, ROOMHOPPER.com will not refund any such charge to your credit card, debit card or PayPal account. 10.	j) – The information, software, products, and services published on this website may include inaccuracies or errors, including pricing errors. In particular, ROOMHOPPER.com and ROOMHOPPER.com affiliates do not guarantee the accuracy of, and disclaim all liability for any errors or other inaccuracies relating to the information and description of the hotel and other travel products and services displayed on this website (including, without limitation, the pricing, photographs, list of hotel amenities, general product descriptions, etc.). In addition, ROOMHOPPER.com expressly reserves the right to correct any pricing errors on our website on pending and/or confirmed reservations made under an incorrect price. In such event, if available, we will offer you the opportunity to keep your pending reservation at the correct price or we will cancel your reservation without penalty. It is the responsibility of the hotel chain and/or the individual property to ensure the accuracy of the photos displayed. ROOMHOPPER.com is not responsible for any inaccuracies in the photos. 1.	a) – Your booking will become confirmed and final only after receipt of your payment and confirmation is sent by us via an email with your hotel voucher. The booking will be considered confirmed at the time and date ROOMHOPPER.com send you the confirmation. However, in the event of a request for booking, our Customer Support team will process your request and your booking will only be confirmed upon receipt of a confirmation and voucher by email from our Customer Support team. 1.	a) – Accepted methods of credit card payments are Visa, Mastercard, and American Express. We also accept payment with some debit cards and via PayPal. Your payment card / PayPal account is charged by ROOMHOPPER.com for the total amount of the booking upon confirmation. For payments made online via ROOMHOPPER.com you should not pay the hotel directly for the hotel room or service mentioned on the ROOMHOPPER.com booking voucher. Only bookings with payment at the hotel will allow you to pay for your reservation once you arrive at the establishment. These 2 payment options are clearly displayed during the booking process. 2.	b) – ROOMHOPPER (FZ-LLC) delegate the management of all their electronic payment collection (RoomHopper Payment Services registered at TwoFour 54 Media Zone Abu Dhabi, UAE. 3.	c) – If your chosen hotel is not available and we provide you with an alternative option, your payment card / PayPal account will only be charged if you accept the new hotel and the new rate offered. If the given alternative is not accepted by you, no charge will be made on your payment card / PayPal account by ROOMHOPPER.com. 4.	d) – ROOMHOPPER (FZ-LLC) reserves the right to use payment providers for VISA and MasterCard bank cards outside of your residential area. ROOMHOPPER (FZ-LLC) informs you that your transaction could thus be considered an international transaction by your card’s issuing bank and could therefore be subject to an extra fee by the bank. For Switzerland, there are no claim period conditions for international transaction bank fees levied by your card’s issuing bank. For all other countries, the limit is set at 2% of the transaction amount and within a time limit of 90 days after the reservation date for international transaction bank fees levied by your card’s issuing bank. One single bed. Suitable for one person. Two single beds in the same room. Suitable for two people. One double bed. Suitable for two people. Twin or double bed/s plus extra bed, or two double beds. Most hotels do not have one full size bed for each guest in their triple rooms. Two single beds or one double bed in the same room, to be occupied by one person. Twin or double bed/s plus extra beds, or two double beds. Most hotels do not have one full size bed for each guest in their quadruple rooms. Twin or double room with an extra bed suitable for a child aged between 2 and 12 years. Suitable for a child under the age of 2 years. 1.	a) – You must make payment for any extras (such as incidental charges, meals, meal supplements, mini-bar, dry cleaning and laundry) directly to the hotel and always prior to your departure from the hotel. 2.	b) – Outdoor swimming pools are generally open during summer season only. The availability of an outdoor swimming pool facility, or any other hotel facility, is subject to the hotel's own terms and conditions. For the avoidance of doubt, ROOMHOPPER.com will not be liable in any circumstances where a hotel facility (whether quoted on the ROOMHOPPER.com website or not) is not available to you for any reason whilst you are staying at the hotel. 1.	a) – When you are completing the online hotel reservation form, the applicable cancellation policy is displayed. The cancellation policy varies from hotel to hotel and is directly connected with your arrival date, so you must read each one carefully. Some reservations are non-refundable in all circumstances and cannot be cancelled after booking. Please read the specific cancellation policy provided for each hotel on the website and in any emails regarding your reservation. 2.	b) – If you fail to arrive at the hotel that you have booked through ROOMHOPPER.com, the amount that you have paid ROOMHOPPER.com shall not be refundable. 3.	c) – You can make amendments to your reservation if it does not have a "Non-refundable" cancellation policy as stated by the Hotels terms and conditions and/or the ROOMHOPPER.com website. Any modification to a "Refundable" booking will incur in the administrative fee stated at the moment of the booking. Please note that in some cases, you may be charged for the cancellation fee in accordance with the hotels' cancellation policy if the amendment is made after a certain date or falls under an exception. 4.	d) – For modifying the dates of your booking please log in to your ROOMHOPPER.com account and use the "Change my dates" form. For other type of modifications use the "Send a message" form. Our Customer Support team will get back to you with a detailed answer within 24 hours from the receipt of your request. Reservations not amended through ROOMHOPPER.com will become subject to a 100% charge to be applied. 5.	e) – In the event of a confirmed booking becoming unavailable before the check in date, ROOMHOPPER.com will offer a full refund. Where we have prior notice we will contact you by e-mail. However, upon check-in, if the original hotel booked is closed, over booked or has maintenance problems and cannot provide the room(s) booked., you accept that the hotelier is responsible for finding you alternate accommodation of a similar standard and/or for providing you with a refund and there shall be no liability on ROOMHOPPER.com to provide you with a refund or alternative accommodation. 1. Where a refund is properly due to you, and on receipt of your cancellation or amendment email, ROOMHOPPER.com will refund your credit card, debit card or paypal account. -	will not use this website for any purpose that is either unlawful or not allowed under these terms and conditions. 2.	b) – All content on the website is subject to copyright or other intellectual property rights owned by ROOMHOPPER.com or its suppliers and may not be used by you, except as expressly permitted in these terms and conditions. 3.	c) – ROOMHOPPER.com will determine whether there has been a breach of these terms and conditions through your use of the website. If a breach of this Policy has occurred, ROOMHOPPER.com may take such action as it deems appropriate including denying you access to the website, bringing legal proceedings against you and disclosing such information to law enforcement authorities as ROOMHOPPER.com feels appropriate. 4.	d) – If you do not agree with these terms and conditions, you must not use this website. 1. You agree to indemnify and hold harmless ROOMHOPPER.com, its suppliers and any of our or their officers, directors, employees and agents from and against any claims, causes of action, losses, damages, fines, penalties or other costs or expenses (of any kind), brought by any third party against ROOMHOPPER.com as a result of your use of this website or your failure to comply with these terms and conditions. 1.	a) – Force Majeure: ROOMHOPPER.com shall not be liable for any failure or delay in the performance of its obligations under these terms and conditions if the failure or delay is caused by any natural catastrophe, war, civil commotion, industrial disputes, internet outage, terrorism, flood, earthquake, epidemic or any other circumstance beyond its reasonable control. 2.	b) – Entire Agreement: These terms and conditions constitute the entire agreement between the parties relating to the services and products provided by ROOMHOPPER.com and supersede any previous agreement (whether written or oral) relating to the same. No representation, warranty, undertaking or promise shall be taken to have been given or be implied from anything said or written in negotiations us and you, except as expressly stated in these terms and conditions. 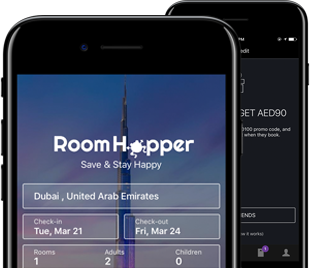 3.	c) – Governing Law and Jurisdiction: This Agreement shall be governed by the laws of The United Arab Emirates, whose courts shall have sole jurisdiction in relation to all matters arising out of or in relation to the services and products provided by ROOMHOPPER.com under these terms and conditions. 4.	d) – No joint Venture: No joint venture, partnership or agency relationship of any kind is created or arises as a result of your use of this website. 5.	e) – Severability: If any provision contained in these terms and conditions is or becomes invalid, illegal or unenforceable, the remaining provisions shall survive unaffected. All rights in this website and these terms and conditions (including all intellectual rights) are fully reserved by ROOMHOPPER.com.